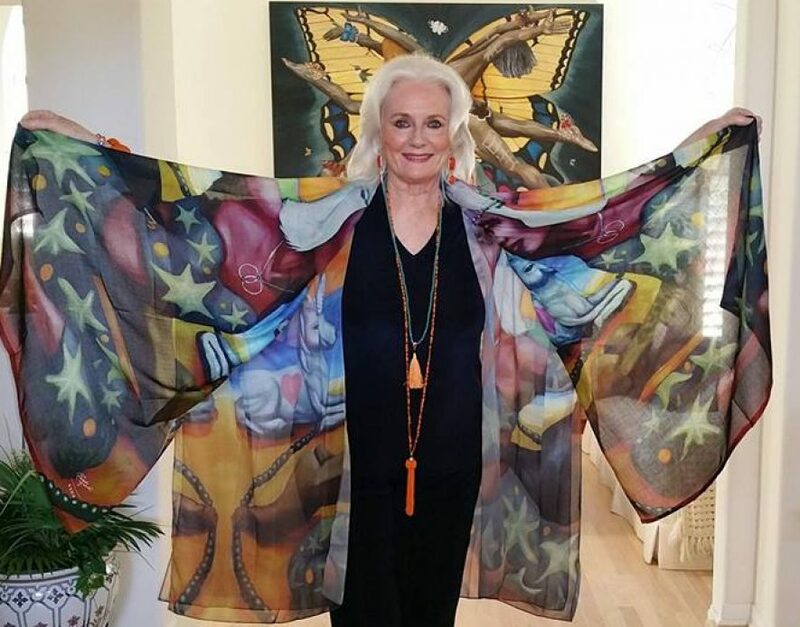 ← Celeste Yarnall Wearable Art, Scarves, Tops, Tee’s, Tote’s and Kimono Style Sheer Wraps! Please welcome my husband Nazim Artist as our guest blogger as he shares his Yoga Medicine Wheels collection of paintings with us. “The impulse for the Yoga Medicine Wheel series of paintings began when my wife, Celeste Yarnall and I first visited Grand Cayman Island in the Caribbean, for her immunotherapy cancer treatment at Perseus PCI. Grand Cayman, a British domain and the largest of the Cayman Islands lies south of Cuba on the map and is normally accessed from Miami, Florida traveling from the US. After making numerous visits through 2016 for Celeste’s treatment, traveling from Los Angeles, I felt compelled to try and capture the poetic revelation made apparent to me within the voyage to wellness and evoke the ‘oneness’ associated by Medicine Wheels & Yoga. Recognizing that the island is becoming a global health hub destination for people from around the world seeking advanced medical treatments, ignited the idea of the Medicine Wheel (a Native American belief system) as drawn in the sand, which would offer a visual metaphor to symbolize the experience and reason of our travels in harmony with the healing energies and soul, of the Caymans, where sand & sea fused with geology impact the bodies need for revitalization. Yoga practice on the island is very much in evidence and in accord with the elemental nature of the environment. Being interested in the human form as a vessel for multi-dimensional expression in my work, yoga poses were selected to convey the imagined choreography staged on the beach to reflect the inspiration for the paintings. The Image at the top of the page, entitled ‘Starfish Medicine Wheel’ (Cayman) the first in the cycle, was Inspired by the Native American notion of the medicine wheel, representing a spiritual belief system based upon the sacred geometrics of the ‘circle’, embodying ideas of infinity, rebirth and motion bound to the ‘oneness’ of everything, thus offering a deep emotional connection for the journey, which saw my twin flame Celeste go through her ordeal with ovarian cancer into remission. The compositional core of the work of having the medicine wheel as a focal point, continues from previous paintings, notably FEMME- Women Healing the World where a circle of women linked arms around each other standing on an atlas of the World. The figures in Star Fish Medicine Wheel (Cayman) appear within a yoga state with out- stretched arms, interlocked. The hands of the male encircled by the woman’s hands, represent the ‘Live Long & Prosper’ iconography from the Star Trek TV series in which Celeste guest starred. The symbolism in relation to her journey through cancer is given profound significance within the artwork as it does in life. The art of wellness which Celeste shares in her professional life is most evident in this context. As part of advanced cancer immunotherapy which Celeste receives in Grand Cayman Island in the Caribbean Sea, the depiction of a beach scene that imagined a medicine wheel drawn into the sand offered a poetic reference to the geographic sense of place. Given the amazing sunset vista’s created by nature the cloud formations have been shaped to reflect the journey from California where Celeste and I reside. The horizon creates the arc of the physical travel with clouds shaped as the states of California, Florida, Cuba and The Caymans along with the OM shaped cloud emphasis in relation to the yogic figures. Starfish, which often surface upon the shore represent the four directions of the medicine wheel, which in this work has the seed of life motif embellished in the pattern of the wheel within the sand. Foot prints on either side echo the energetic trace of presence left by the figures amplifying the notion of spiritual movements, as a tangible reality and universal metaphor for hope & survival upon the path of life. The second in the series ‘Pearl Stone Medicine Wheel’ further evokes the transformative sacred geometric harmonics connected to the healing mantra’s of energy fields and healing codes found present within the elements of stone and reference the unique ‘caymanite’ rock of the island, the surface of which is the out crop of a vast limestone rich mass beneath the water surface. Mermaid Medicine Wheel (Vesica Piscis) imagines the medicine wheel as the ‘vesica piscis’ in relation to sacred geometrics. The teal wristband worn by the female figure in the foreground (doing the yoga mermaid pose), is inscribed with PERSEUS, the name of the immunotherapy cancer clinic treating Celeste. Teal being the chosen color of ovarian cancer awareness, defines the context for her treatments. The Green bracelet derived from tree nuts which are hand painted in bright colors, adds to the Caribbean nature of the image, as we note the Grand Cayman shaped clouds in the sky between the Perseus and nut bracelet. Both figures are located within the interlocking pearl circles that form the ‘vesica piscis’ symbol, further echoed by the necklace worn by the Mermaid Celeste, along with the pearl headband with the silver mermaid. The sacred sign of the ‘vesica piscis’ denotes Goddess Worship apparent to the personal context of the picture. The Starfish embellished swim suit of the woman reveals the ‘heiros gammos’ aspect of the union between the male/female harmonic, as suggested by the inter-connectivity of the circles, a manifestation of the pearl that occupies the open oyster shell. The cobra yoga pose of the male figure evokes the transformative struggle through challenge into awakened potential, by shedding its skin the serpent is reborn which powerfully captures the energy of the new life that comes in the wake of surviving an ordeal like cancer. The OM symbol on the wristband of the male figure carries the eternal resonance of universal oneness. The magical presence of the ‘love’ unicorn offers a multi-dimensional element that elevates the syntax of the painting according to the alchemic nature of the artwork. The figure in ‘OM Circle’ whose outfit displays Mulberry Hearts, is posed within a circle with stones that create the OM symbol, with four heart shaped stones representing the four directions of the medicine wheel. The heart shaped stones are commonly found on the beach paralleled with the shape of the clouds suggests the ‘heartgasm’ or heart universal love field of the ‘OM’ mantra. In resolution to the Yoga Medicine Wheel the figure within the circle remains the core representational motif of the paintings. However,unlike other medicine wheel designs in the series, ‘Celestial LabyRunes’, takes the shape of a three circuit labyrinth drawn in the sand. The footprints allude to the figure having walked the circuit, adding to the meditative nature of labyrinth ritual. Two turtles either side of the circuit create a trail that enhances the notion of the ‘Path’. The pose of extension assumed by the figure parallels the leaping dolphin, in accord with the harmonic arc flowing through the composition. Also part of this series is the Starfish Heart Circle – 24” x 24” inches – oil on canvas, which ties into the medicine wheel imagery. See www.NazimArtist.com to learn more about Nazim’s paintings and the holistic glaze he uses that has Far Infra Red particles and Negative Ions in it. See https://www.patreon.com/NazimArtist to learn about how to become a Patreon for Nazim. Please see many of these beautiful paintings translated into Wearable Art at http://shopvida.com/collections/voices/nazim-artist Here you will find Kimono Style Sheer Wraps, scarves, tops, tees and Tote Bags where the art works have been translated to these designer items. Proceeds inure to the Celeste Yarnall Cancer Immunotherapy fund.